Malayalam Industry is also known as Mollywood based in the southern state of Kerala. It is the fourth largest movie industry in India. However, this industry makes various movies in different genres and peeps eagerly watch their movies. And, this industry is flourishing day-by-day and in the making of new movies. In this article, we are going to see Top Malayalam Romantic Movies. Niram is the top Malayalam romantic movies directed by Kamal and produced by Johny Sagaria. It stars Kunchako Boban and Shalini in the lead roles. The film released in the year 1999 and successfully achieved commercial success. The film raked 5 crores on the Box Office Collection and received positive reviews from the public. In addition, the movie remade in Telugu as Nuvve Kavali, in Tamil as Piriyadha Varam Vendum, and in Hindi as Tujhe Meri Kasam. Niram made a theatrical run of more than 150 days due to the positive reviews from the public. This is the third biggest film of the year and it became immensely popular among youngsters of that time. The film earned 6.9 ratings out of 10 in IMDB ratings. Bangalore Days a Malayalam romantic movie written and directed by Anjali Menon and co-produced by Anwar Rasheed and Sophia Paul. The film released on 30th May 2014 and accomplished good success on the big screens. However, the film raked 45 crores against the budget of 10 crores. Furthermore, the film received 3 Kerala State Film Awards including best actor, actress, and director. Later on, the movie remade in Tamil as Bangalore Naatkal directed by Bommarillu Bhaskar. Bangalore Days is the highest grossing Malayalam film of the year and one of the highest Malayalam grossing film of all time. It earned 8.3 ratings out of 10 in IMDB ratings. Premam a Malayalam romantic movie written, edited, and directed by Alphonse Puthren and produced by Anwar Rasheed. The film released on 29th May 2015, followed by UAE on 11th June 2015. The film made in the budget of 4 Crores and generated 60 crores in return. The movie tasted immense success on the big screens and public and critic reviews are good. Moreover, the film had a theatrical run of 151 days in Kerala and 259 days in Tamil Nadu. The movie also remade in Telugu in 2016 with the same name. Permam a superhit movie considered as one of the highest grossing Malayalam movies of all time. The movie earned 8.3 ratings out of 10 in IMDB ratings. Thoovanathumbikal is one of the Top Malayalam Romantic Movies written and directed by P. Padmarajan and produced by p Stanley. The film released on 31st July 1987 and the running time of the movie is 157 minutes. It stars Mohanlal, Parvathy, and Sumalatha in the lead roles. Nevertheless, the movie partly based on P. Padmarajan’s novel Udakappola. Thoovanathumbikal gained a huge fan following after its released and the film ranked #8 by IBN live in its list as a greatest Indian film. Moreover, the film tasted immense success on the big screens and on the Box Office Collection. The film widely known for its film score, songs, and dialogues. However, the film earned 8.7 ratings out of 10 in IMDB ratings. Ennu Ninte Moideen a Malayalam biographical romantic drama film written and directed by R.S.Vimal. The film based on a real-life story of B.P. Moideen (Politician and Film producer) and Kanchanamala. The movie released on 19th September 2015 and it stars Prithviraj Sukumaran and Paravathy. The movie made in the budget of 12 crores and generated the revenue of 50 crores. Ennu Ninte Moideen received a positive response from the public and gained commercial success. However, it received 8 ratings out of 10 in IMDB ratings. 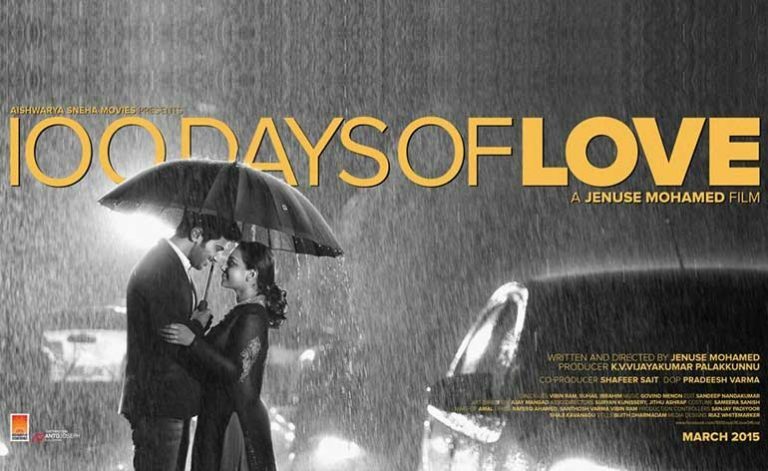 100 Days of love is one of the top Malayalam Romantic Movies written and directed by Debutant Jenuse Mohammad. It stars Dulquer Salmaan and Nithiya Menen in the lead roles. The film released on 20th March 2015 and achieved moderate success on the big screens. However, it received positive critics and public review and it is considered as an average movie. Furthermore, V.P of IB times called the film one of the cutest rom-com movie ever made in Malayalam. The film made in the budget of 4 crores and it didn’t generate much revenue. The movie is considered as an average and it earned 6.6 out of 10 in IMDB ratings. Chemmeen a Malayalam romantic film directed by Ramu Kariat and produced by Babu Ismail sait. Starring Madhu, Sheela, and Kottarakkara Sreedharan in the lead roles. The movie released on 19th August 1965, it is based on the novel of the same name by Thakazi Pillai. Nevertheless, the movie received strongly positive reviews and considered a brilliant film. Moreover, this is the first film to get Gold Medal for the Best Film from the President of India. Also, the film screened in various international film festivals and won awards at the Cannes and Chicago festivals. Later on, the film dubbed in Hindi as Chemmeen Lahren and in English as The Anger of the sea. Cheemeen earned 7.8 ratings out of 10 in IMDB ratings. Another top Malayalam Romantic Movies Thenmavin Kombath a romantic comedy adventure film written and directed by Priyadarshan. Starring Mohanlal and Shobana in the lead roles. The film released on 13th May 1994 and successfully hit on the big screens. However, the movie won National Filmfare Awards for Best Cinematography and Production Design. Furthermore, the film has appeared as a blockbuster at the Kerala Box Office Collection. The movie is considered among the audience and critics as the best comedy films in the Malayalam industry. In addition, the movie received two National Film Awards and 5 Kerala State Film Awards in different categories. Thenmavin Kombath earned 8.1 ratings out of 10 in IMDB ratings. Thattathin Marayathu is one of the top Malayalam Romantic Movies written and directed by Vineeth Sreenivasan. Starring Nivin Pauly and Isha Talwar in the lead roles. The movie released on 6th July 2012 and it’s based on inter-relationship between a Hindu boy and Muslim girl. The movie made in the budget of 3 crores and in turn it made 18crrores on the box office collection. Eeta is one of the top Malayalam Romantic Movies directed by I.V Sasi and produced by Rajamani. The film released on 10th November 1978 and it’s about a triangular love story between Kamal Hasan, Sheela, and Madhu. The film achieved success on the big screens and perform well on the Box Office Collection. Nevertheless, due to some steamy scenes the movie, some reviews are on the negative side. Furthermore, Kamal Hasan received the Filmfare Award for the Best Actor in 1978. The overall performance of the movie is at its best and audience loved it. The film earned 7 ratings out of 10 in IMDB ratings. These were the top Malayalam Romantic Movies of all time. If you have some suggetsions let us know in the comment below. We would like to know which is the top Malayalam Romantic Movies according to you.